The early life of Edvard Munch was tragic. His mother died of tuberculosis when he was young, as did an older sister. Another sister suffered from mental illness. Edvard’s family was poor. Munch himself was a sickly child, and much of his artwork flows from the atmosphere of sickness, dread, and terrible grief that lay over the family. 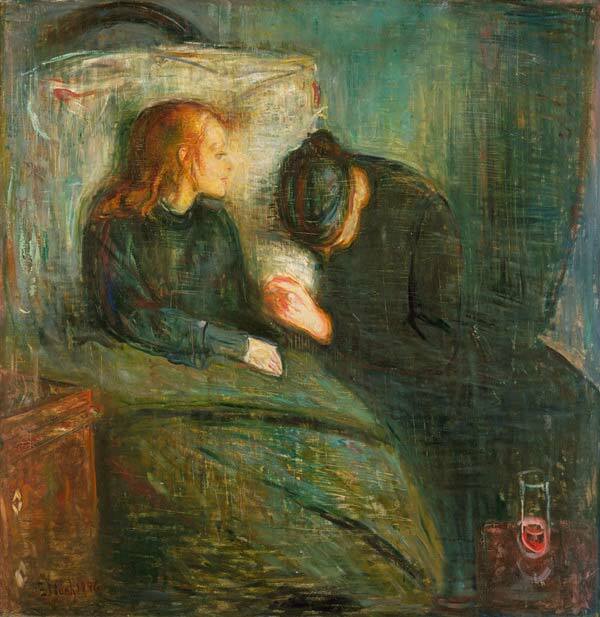 Munch’s painting, Sick Child, is an example of expressionism. Often, the figures in expressionist works are distorted to better show the emotions or to convey a mood. In Sick Child, Munch’s brushstrokes are harsh and the color palette consists mostly of dreary blacks, whites, greens and grays. ​Munch’s The Scream is very expressive of emotion. It can be said that it shows fear, worry, or mental unwellness. The colors, movement of the shapes, the character’s face, and the hands guarding his ears express a feeling of being upset. The Scream is his most well-known, but here are some of the other paintings by Munch. In May 2012, one of the four versions of Munch's "The Scream" was sold in an auction at (Saw-tha-bee’s) Sotheby's in New York for more than $119 million to businessman Leon Black. This was the second highest price paid for a painting at an auction. That version is the only one of the four now owned privately. The other three are in museums in Norway. 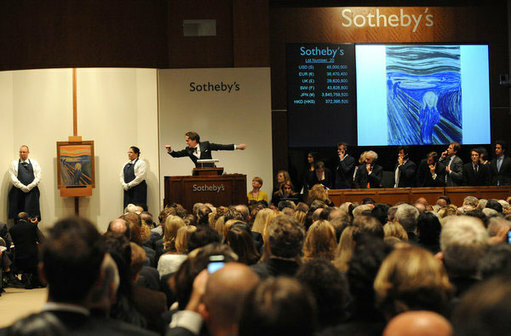 The big sale sealed The Scream’s reputation as one of the most famous and important works of art ever produced. The Scream has been the target of a number of thefts and theft attempts. In On February 12, 1994, the same day as the opening of the 1994 Winter Olympics in Norway, two men broke into the National Gallery in Oslo and stole its version of The Scream, leaving a note reading "Thanks for the poor security". 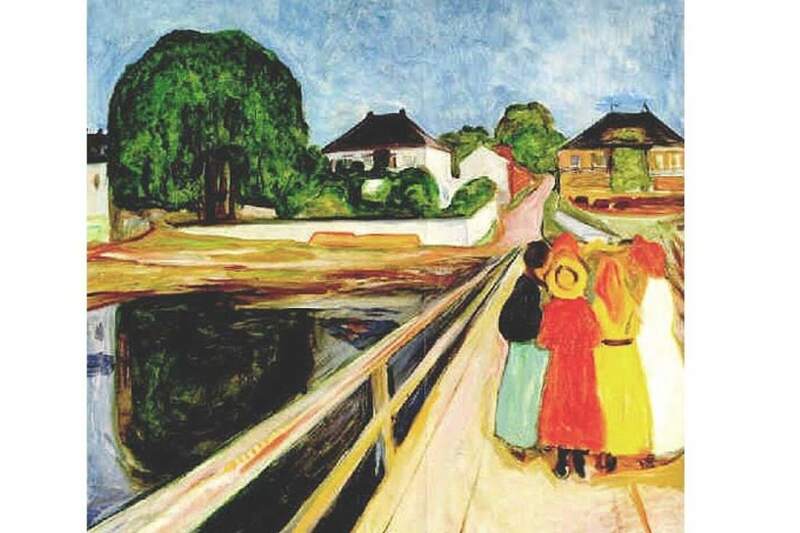 The 1910 tempera version of The Scream was stolen in 2004, during daylight hours, when masked gunmen entered the Munch Museum in Oslo and stole it and another painting by Munch. A bystander photographed the robbers as they escaped to their car with the artwork. The Munch Museum was closed for ten months for a security overhaul. The thieves were all captured and the paintings were recovered both times. Some minor damage was suffered by one of the paintings when it was stolen. "The Scream". En.wikipedia.org. N. p., 2016. Web. 2 Nov. 2016.